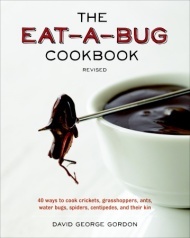 With its stylish new package, updated information on the health and environmental benefits of insect eating, and breed-your-own instructions, this new edition of The Eat-a-Bug Cookbook (originally published in 1998) is the go-to resource for anyone interested in becoming an entomological epicure. For many Americans, eating a lowly insect is something you’d only do on a dare. But with naturalist and noted bug chef David George Gordon, bug-eating is fun, exciting, and downright delicious! Today, there are more reasons than ever before to explore entomophagy (that’s bug-eating, by the way). It’s an environmentally friendly source of protein: Research shows that bug farming reduces greenhouse-gas emissions and is exponentially more water-efficient than farming for beef, chicken, or pigs. Mail-order bugs are readily available online, but if you’re more of a DIY-type, The Eat-A-Bug Cookbook includes plenty of tips for sustainably harvesting or raising your own.